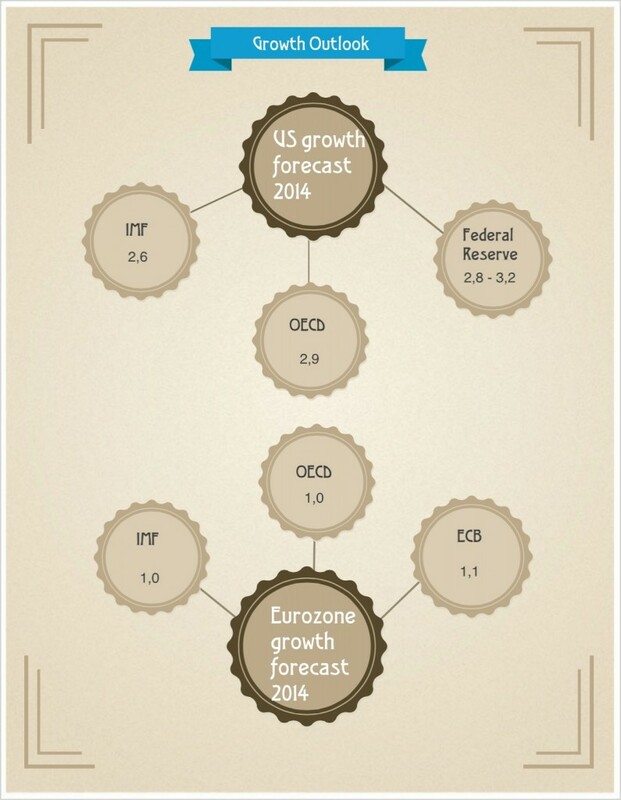 2014: back to growth… sure? Economic outlook for 2014, following the main institutions’ projections, is more positive than the years before. The slope upwards is far from being strong, but there is a consensus in some points. First of all, US will be back to growth, with projections over 2.5% for the GDP next year. The more optimistic is the Federal Reserve, with a perspective between 2.8% and 3.2%. It is not very surprising, as this institution decided yesterday to reduce the quantitative easing programme. The Fed sustained that the economic improvement is “consistent”. The outlook for the OECD is also similar to the Fed. Just the IMF is a bit far, because its last projection was in October, in the days of the Administration shutdown. Secondly, the Eurozone will have a low growth for 2014. It also surprises that the ECB is the more optimistic (1.1% GDP growth) against the OECD and the IMF, which agreed in this projection in 1.0%. Last monthly bulletin from the ECB stated that the risks for the Eurozone are still on the downside. The central bank underlined the uncertainties in the global money and financial market. The point is that the general growth pace is still slow. Emerging economies will suffer in 2014 a slower growth and there are doubts about their reaction with a further tapering from the Federal Reserve and the instability in the currency markets. What Japan refers, Abenomics (the economic policy measures developed by Primer Minister Abe) will hit hard in the inflation, as a result of the monetary expansion, but the country will return slightly to growth. In any case, the main institutions do not close the crisis yet. Although all try to show a more positive tone, the risks are still persistent, mainly in the credit markets and the investment, but also in the consumption, affected by the general uncertainty. Finally, the point in 2014 is still in the monetary policy measures, as all market agents react strongly to every decision and comments from the central banks. This entry was posted in Our Charts and tagged Emerging markets, Eurozone, GDP, Japan, US on December 19, 2013 by Oscar Garcia. After a quite good year in the financial markets, with good figures and profits, the question emerges: what about next year? Will it be better, worse or as good as 2013? Analysts are quite optimistic in their forecasts for 2014. First of all, the mood is mainly bullish for next year. Market consensus agrees about double-digit returns in the stock exchanges. It is considered that US economy will grow, the monetary policy will remain expansive (despite the possible Fed tapering) and the interest rates will be still low. The statistics help also this optimistic mood. A good year is followed by another upwards, so the studies. Since 1945, S&P 500 recorded an average 10% up after a year with 20% increase (in the most of the cases, not ever). When we look at the different assets, equities are expected to provide the highest return, following a survey amongst investment professionals. 71% bet for them, against 4% for bonds and 10% for commodities. What products refer, ETF will also receive a push up, as another survey announced already in October. 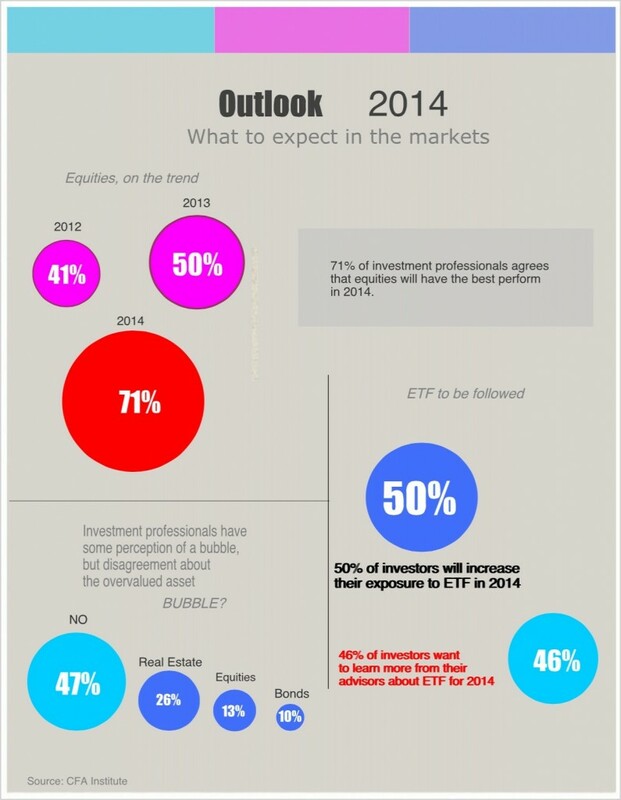 At least, 50% of investors planned to increase their ETF exposure in 2014 and 46% wanted to learn more about them from their advisors for next year. However, there are also risks and fears for analysts. The uncertainty about the tapering (mainly, how deep it will be) is still a shadow for the investors. That is the concern for 68% of the CFA Institute members, for instance. The Fed meeting this week will possibly bring more light about this point. Political instability is also a problem. And it emerges a perception of financial bubble again, but with disagreement amongst the overvalued asset. To sum up, there is a bullish spirit for 2014 in the air. After these long years of financial crisis, banking resize and unordinary monetary policies, the investors keep on the mood that has inspired 2013, with high returns and profits, and expect a good year in the stock markets. This entry was posted in News and tagged 2014, Bullish, Outlook, Prospects, Stock markets on December 16, 2013 by Oscar Garcia. Do you dare to improve your investment performance with T-Advisor? T-Advisor, the advance suite to manage investment portfolios, intends to provide its advantages to the widest range of investors and financial advisors. Our tool was designed thinking about the individuals’ needs and the most possible easiness to use it, so that nobody could feel excluded from finance managing. Our next step: we invite you to trial T-Advisor free for three months with access to the whole premium package. We are sure that this period to trial T-Advisor will convince you about the usefulness and usability of it. T-Advisor will become an essential software to manage your portfolios. After these three months, you will keep enjoying the tool just for 20 euros each month. T-Advisor is full of interesting functionalities to help you decide the best investment to outperform the market. When we designed T-Advisor, we were sure that our strength had to be information, figures, data and charts. But these contents are useless, if they are not correctly organised. T-Advisor offers full reports with graphs from your positions and portfolios to learn from the data your next steps. Risks, volatility, liquidity will be under your control with T-Advisor. Recommendations and continuous news feed are also available. And last, but not least: we are confident in the technical analysis and Quant portfolios as powerful tools to take the right decision just with a clear target: improve your wealth. Visit our website to get more information about the whole details of T-Advisor and try it free for three months with all the premium services. 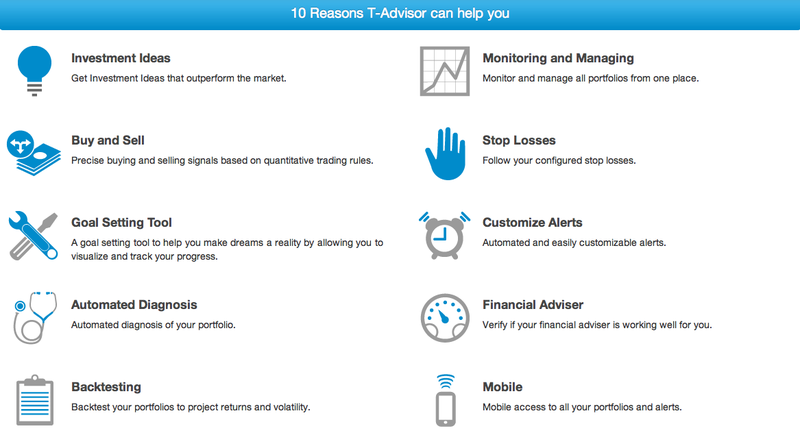 T-Advisor is also available for mobile in Android, iOS and Windows 8 systems. Do dare it! This entry was posted in Discover and tagged mobile app, Premium, Quant portfolios, technical analysis on December 12, 2013 by Oscar Garcia. Finance markets have a steady factor to be considered: risk. When we invest our money in any asset, we take a risk, because it is not given for sure that the value will increase so much as we expect. Even we cannot be sure if the value will increase. The analysis about the risks in our investments has to take into account two measures: liquidity and volatility. The liquidity reports about the asset’s ability to be sold without changing significantly the price and with the minimum loss. For instance, housing is less liquid than bonds or stocks. This example is easy to perceive, but it is not so easy, when we compare stocks or bonds. Technical and fundamental analysis tools are needed. On the other hand, volatility reports about the variability of an asset’s price in a certain period. In other words, how far are current prices from its average. The more changes up and down, the more volatile. There are many reasons that alter highly the prices: a crisis, rumours, figures, political or economical decisions. There are some references to measure volatility in stocks indexes: VIX for S&P500, VXN for Nasdaq or VXD for Dow Jones, just to mention some of a long list. Separately, both measures offer the investor some information, but linking both the investor obtains much more. There is an inverse correlation, because a very volatile asset is less liquid. Money exposes to more losses when we play so risky. But the ones who follow markets and use tools to be reported about stocks for trading can get higher revenues profiting from this violent changes in the prices. This is, for instance, the case of T-Advisor. The suite offers graphical studies about volatility and liquidity of every stock. An investor has available the last 6 years volatility figures and the risk evaluation. 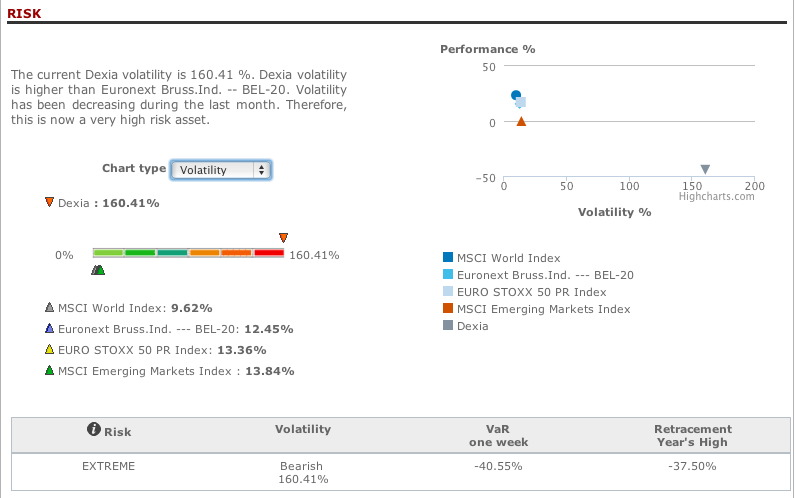 It also compares the stock volatility with the main stock indexes as MSCI or Euronext. After having the best information, it is just the investor decision: how risky is your investor’s profile? This entry was posted in T-Advisorpedia and tagged liquidity, MSCI, risk, VIX, volatility on December 5, 2013 by Oscar Garcia. Exchange rate between Euro and Dollar is far from being stable. 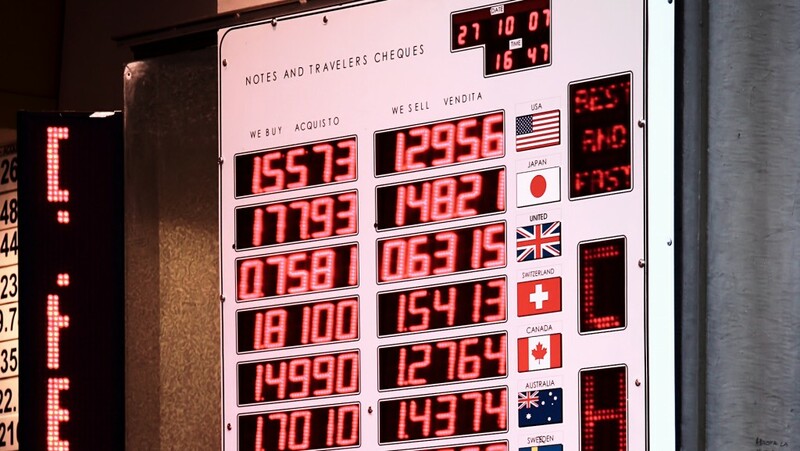 When the Euro began in the markets, the exchange with the Dollar was 1,15. Then it dropped till 0,85 in October, 2000; but it jumped till 1,60 in the summer of 2008. The rate for 2013 has been between 1,27 and 1,38, what is also quite volatile. A strong Euro or a weak Dollar has, as usual in markets, both good and bad consequences. The strength of a currency shows the confidence that investors have in the economy. It also shows the outlook that investors have in the revenues of their investments. In this case, the look should be focused in the interest rate. The highest, the better, in comparison with the other currency. ECB has kept a higher rate than the Fed and that explained partly the strength of the European currency against the greenback. But the Fed did also its work to push this trend. The quantitative easing, that means, the massive money printing of Dollars, operated also as a reduction of the interest rate. The economic effects of a weak Dollar are several. European industries enjoy fewer costs from imports and commodities, as they are cheaper; European tourists find also cheaper have holidays in the US. Against that, exports are more difficult and Europe receive fewer US tourists. But what about finance markets? A weak Dollar supports buys in US markets, as they are cheap, but the investment returns are lower when they are converted into Euros. However, listed companies with an export-focused business get more revenues. For an investor, these companies have more chances not only to increase the value of their stocks, but also share dividends. In other perspective, it is interesting for an investor to have a diversified portfolio with securities in Dollar and Euro to protect from exchange risks. Dollar is now weak, as the Fed has promoted this policy to cheer up the economy and the employment. But this weakness is far from meaning that the greenback is living a decline. The US currency is still the reference as a reserve. Although the future is impossible to predict, experts and analysts tend to think that Euro will weaken against Dollar in 2014. The current ECB policy and the possible tapering of the QE by the Fed open new chances for investors, as European securities will be cheaper for foreigners in a strong contexts for the stock exchanges, following the increases of European indexes. This entry was posted in News and tagged Currency, Dollar, Euro, Exchange rate on December 2, 2013 by Oscar Garcia.